Another solid weekend for Alex as the Ginetta GT5 Challenge joined the British Touring Car Thruxton spectacle for the first time of the year! Qualifying saw Alex storm to his maiden pole position by nearly half the second before returning to the pit lane early to sit and watch his competitors continue to pound round the high speed Thruxton circuit trying unsuccessfully to better his time! When the opening race got underway Alex maintained the lead until the red flags after an incident down the field. Alex maintained his position after the second restart and at the head of the field began to set the pace but found himself unable to break the tow on the vast straights and high speed sectors of the Thruxton circuit, therefore struggling to get away from the chasing pack. The pressure from behind would tell on the eighth lap as he slipped back to fourth place but in a four-car fight that would run right through to the finish, he emerged with third place finish. A solid result after such a close and tough race. Race two in front of a bumper crowd and live TV coverage saw Alex once again challenging at the front of the field, having run in a podium position in the early stages, Alex hit the front on lap eight. He held the lead well on older tyres than his surrounding competitors, however a small error exiting the final corner then allowed the chasing pack to fight back and Alex would end the race just off the podium in fourth spot only 0.8 of a second off the leader in a photo finish between the top 2. “It’s been another strong weekend and we’ve put more good points on the board. After the performance at Rockingham last time out, it was important to show that our results there weren’t a one-off and we have shown here that we are genuine contenders. “I didn’t expect to qualify on pole by such a margin but this is a circuit where it is so difficult to try and win because you have to break the tow if you don’t want to come under attack from behind. 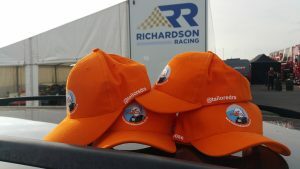 Big thank you as always to the Tailored Resourcing & Accountancy for all their support and the orange Bert Goose hats! And to Richardson Racing, Lodestone Projects & Proceed Group and of course to my parents couldn’t do it without them. It was great to meet you and your parents at Thruxton. Best wishes for future races. Could you please send me Matt’s contact details as I wish to thank him for telling Jenny and I about racing at Thruxton and introducing us to your mother and father. It was a pleasure to meet you both too and thank you for calling in to see us. Hopefully we will see you at a race weekend again soon. I noticed you haven’t entered the Silverstone competition yet? There is still time! I will email you Matts details direct.